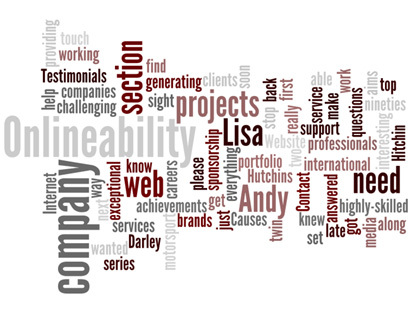 At Onlineability we believe we can help put your business or organisation on an excellent footing for online success by helping you resolve your web and information management problems. Here are some reasons why we believe we are a good partner for anyone looking for web services. We hope they will give you a feel for our strengths, and the many ways in which we may be able to work with you. If you have any questions, or would like to find out more about our services, contact us here. We work with the WordPress content management system because we think it has substantial advantages – including keeping product costs down and being easy to use and update. We have built successful WordPress-based sites for organisations ranging from a large institution to a sole trader. We are confident we can make it work for you too. We build sites that are easy for you and your stakeholders to use. We believe passionately in usability and build our sites to make them as easy as possible for you to update. We also focus on the user during the development process to make sure they can get the information they need at every stage from the site’s front page to its deepest content. Our WordPress sites come complete with user documentation that will help guide you step by step through routine tasks without stress or fuss. Our sites are coded to high specifications, using up-to-date methods and meeting all applicable standards including accessibility guidance. Because we do this, they are particularly easy for search engines to navigate meaning a large part of the work of optimisation comes built-in. We have extensive copywriting experience gained working for national newspapers and websites, international news organisations, agencies and top brands. We can tailor our service to reflect your specific needs, writing and editing everything from reports and press releases to short, Google-friendly web pages and product copy. We can prepare documents and presentations for upload to your website so they will be a credit to you. There are three components to a successful website – design, content and structure. An unsuccessful web project will often focus on design to the detriment of the other two, fail to consider structure and view content as a bolt-on extra. Not us. We take as much care over the structure and navigation of your site as we do the design, ensuring it works well for you and meets the needs of your users. We believe few businesses of our size offer the standard of information design that we do.